A sad ending for a very special lady! On Sunday, July 17, David and I were on our way to the classic car rally at Newby Hall and looking forward to meeting our Mercedes-Benz club friends when we were hit by another car. Thankfully David, who is an observer/trainer with the Northallerton branch of the Institute of Advanced Motorists, had spotted the danger and taken evasive action otherwise we, and the other driver, would have been very badly hurt. Even so we were very badly battered and bruised and both cars have been written off. 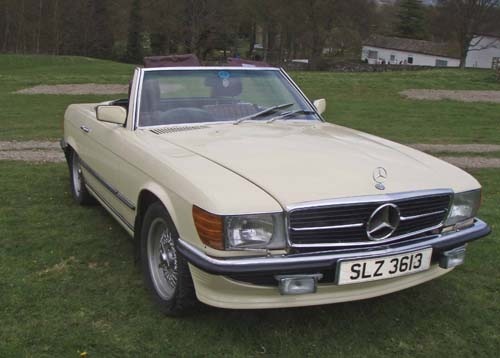 The Mercedes 280SL had been David’s pride and joy for many years and been a very enjoyable car to drive, especially in summer with the top down. We are very grateful to those who helped us that Sunday – including the doctor who came with the Great North Air Ambulance who even gave Raq, David’s elderly blind dog, a check up before handing him over to the capable hands of our friend Margaret. Our thanks also to the staff of Lowes Breakdown and Recovery Ltd at Brompton on Swale who were so helpful whenever we visited their storage yard to collect items from the SL afterwards. Below: That lovely lady before July 17. 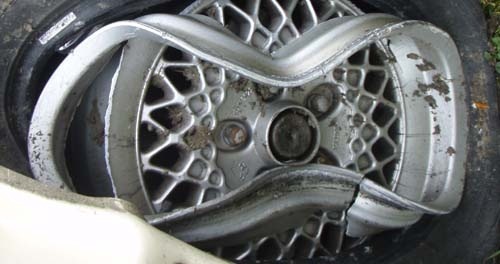 Comments after the “crash”: “What a pity for the old lady but she was clearly made of stern stuff and saved you from far worse!” and “Gosh – what a good advert for the strength of Mercedes cars!” Below: The crash created an interesting piece of wheel sculpture! Before the crash David had two Mercedes – the 280SL and 300SE. Afterwards he went to Gasoline Alley at Bingley – a place we had spotted when on our canal holiday in October 2010 – and traded in the 300SE for a Mercedes 124 320E Cabriolet. He does love convertibles but didn’t feel he could ever replace the 280SL he had lost. So we went to the RAF Leeming Families Day on July 30 in the Cabriolet. For two battered and bruised people it was a very comfortable car. And it was great to meet up with many of the friends we had missed seeing on July 17.